It’s getting cooler, which makes me think about Fall recipes again. This comforting, home-style Shepherd’s Pie has lean ground beef, chopped onions, creamed corn, sweet corn and mashed potatoes — that’s it. Simple, stick-to-your-ribs fare. I made it last weekend before a visit to Mark’s 90-year-old grandfather, who gets Meals on Wheels because he is legally blind. How depressing! Whenever I can, I bring him a home-cooked meal to enjoy. This is an easy one to pull together. The only time-consuming part is the 45 minutes it spends in the oven; if you make it on the weekend or in the evening before bed, it’s ready to go for the next few days. 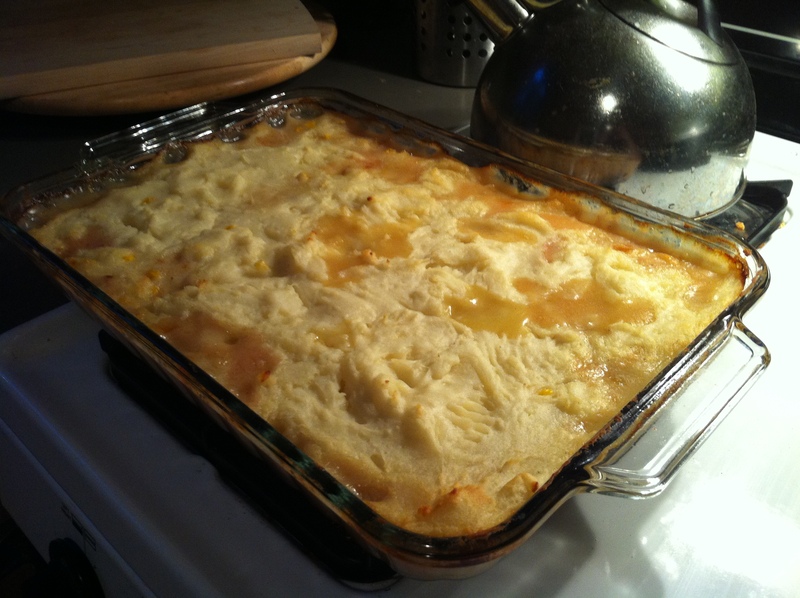 This is one of Mark’s favorites, and has been ever since my Mom taught me how to make it (in miniature ceramic baking dishes) for lunches when I had my first job out of college. By the way, you could do the same thing — just buy those handy single-serving bakers or ramekins and adjust the cooking time as needed. 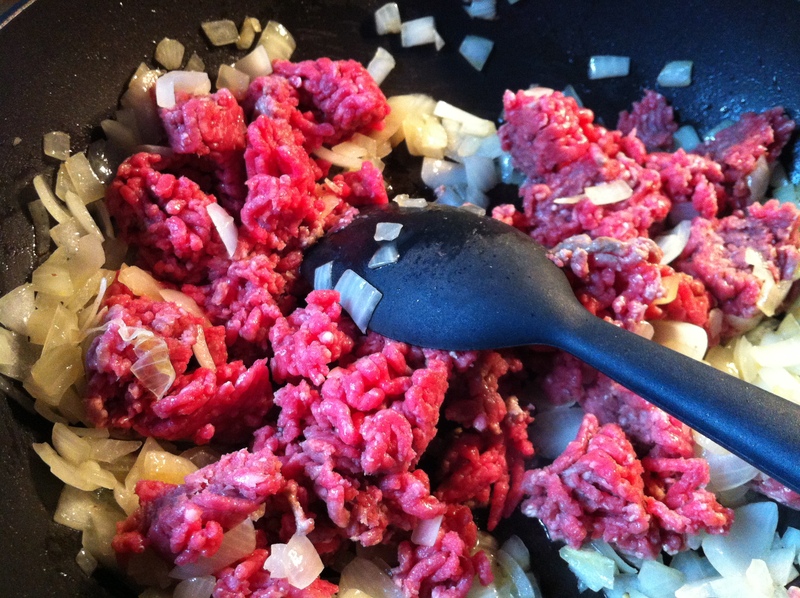 Then you are going to add the pound of lean ground beef into the pan, breaking it up with your spoon and stirring until the meat is just browning. Don’t overcook it, because it will continue to cook through in the oven. 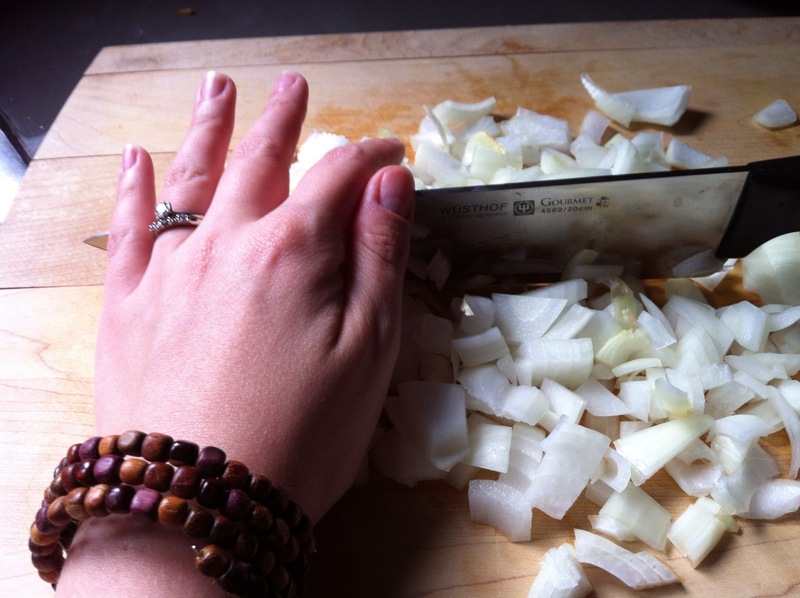 Remove the cooked beef and onions from the heat and get out a large glass baking dish. I like my Anchor Hocking bake n’ take set because it comes with a matching cover and carrying case, which is great for transporting and storing in the fridge (it’s especially handy around the holidays). 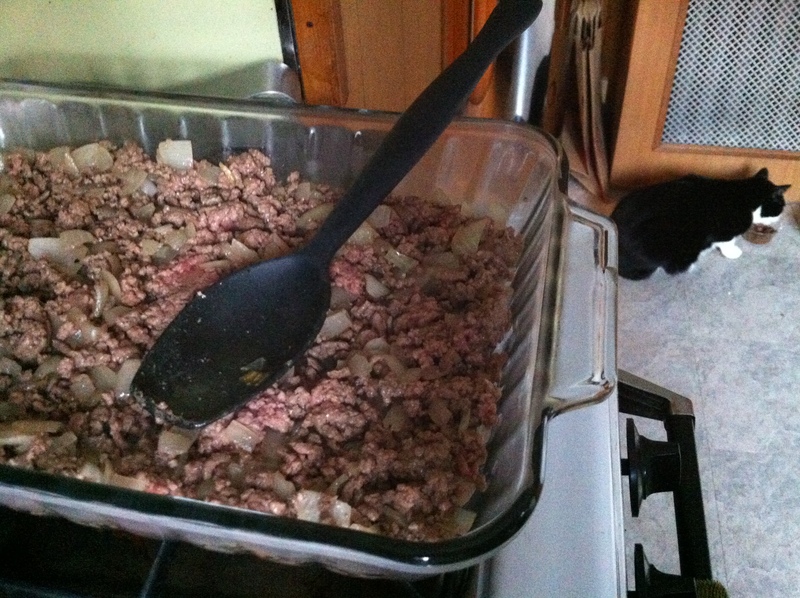 Pour the ground beef into the baking dish, spreading out in a very thin, even layer. Don’t be concerned if it just barely covers the bottom of the dish. It’s supposed to be that way. This is a redundant picture. A certain fuzzy assistant photo-bombed me. 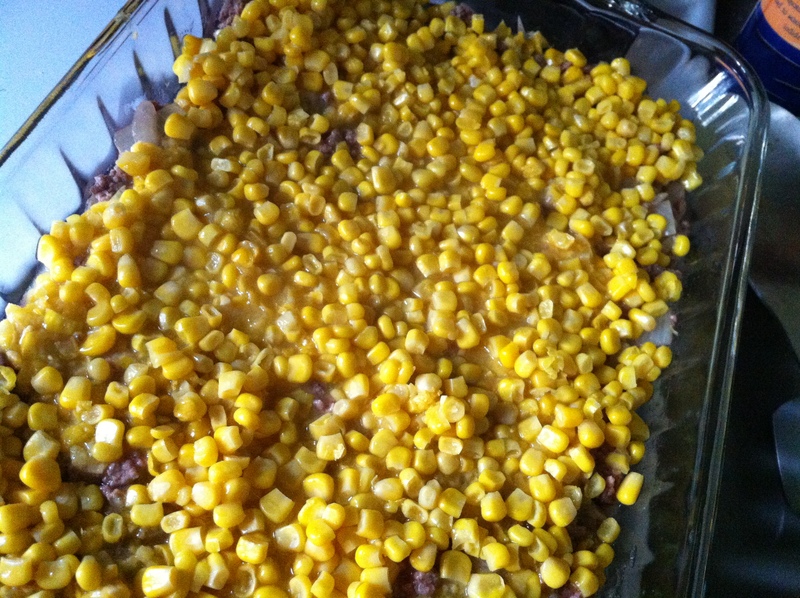 Add the creamed corn next……..
…………followed by the sweet corn. Now you’re ready to add the mashed potatoes. 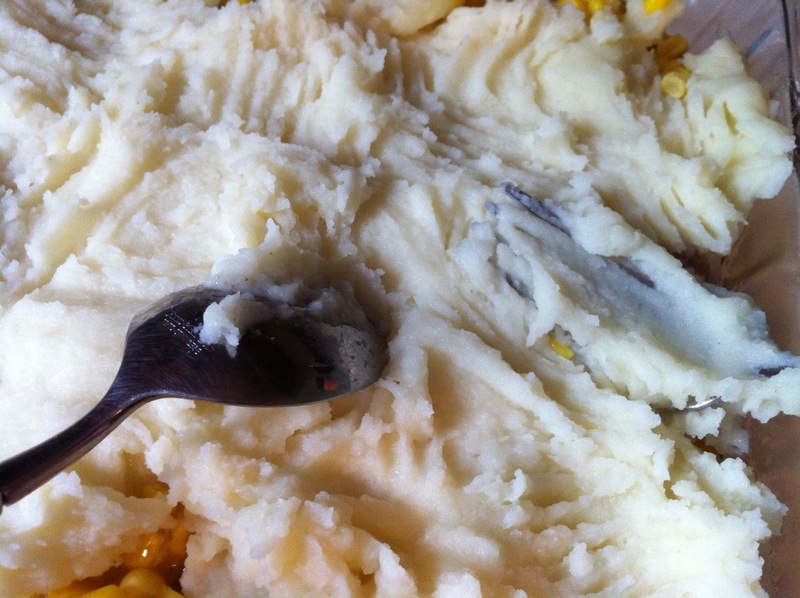 Full disclosure: I used to make the mashed potatoes from scratch, but one time I cheated, and Mark said “you HAVE to make it this way from now on.” Well…I’m not going to complain about a shortcut tasting better. So from then on, boxed potatoes it is. Either way you do the potatoes, make sure you add a lot of butter and milk so it stays moist. 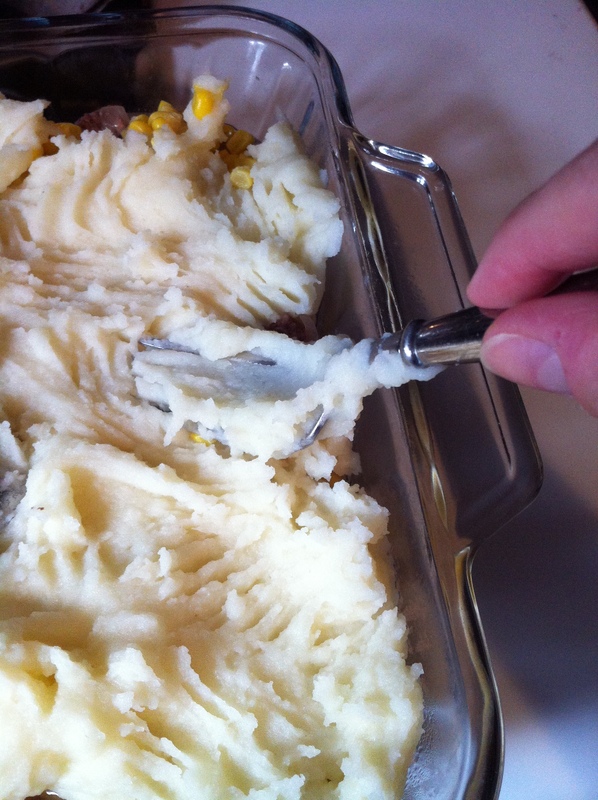 I find it’s easier to spread the potatoes onto the Shepherd’s Pie in big blobs that you push outward with two forks to cover the whole surface. If you try to drop the whole mess of potatoes into the center and spread outward, you’ll just end up dragging up loose corn and making a mess. 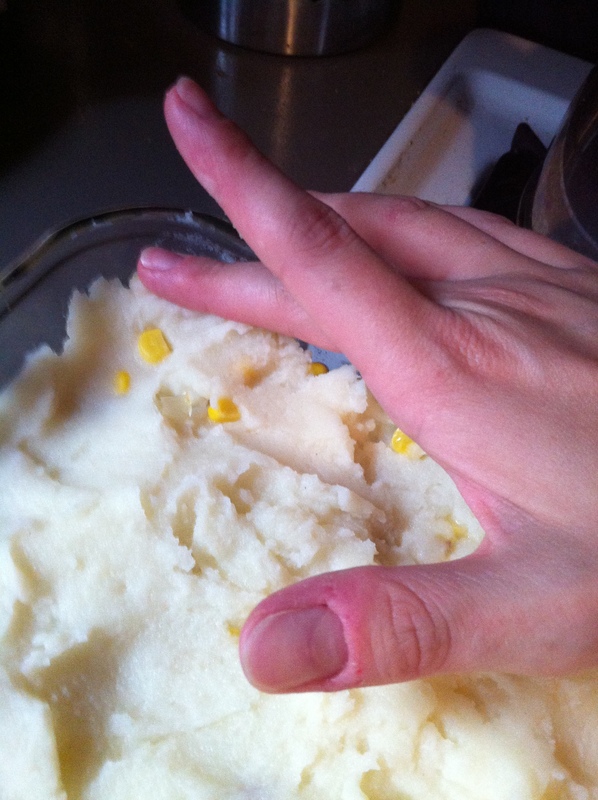 Then, take your hand and just pat it down all over so the potatoes are roughly even in the pan. Anything sticking up will just burn, and you don’t want that. Cover with foil, pop it in the oven at 350 for about half an hour, then check on it. If it hasn’t browned yet, continue cooking uncovered for about 10 more minutes, checking back frequently so that you take it out when it’s just starting to brown at the edges and bubble up. You don’t, obviously, want to burn it. If it needs more than 10 minutes, so be it! Just keep an eye on it, and the browning potatoes will tell you when it’s done for your oven. Once it’s not boiling hot anymore, it’s ready to eat! I like it warm, not steaming hot, and it makes unbelievable leftovers. Enjoy. 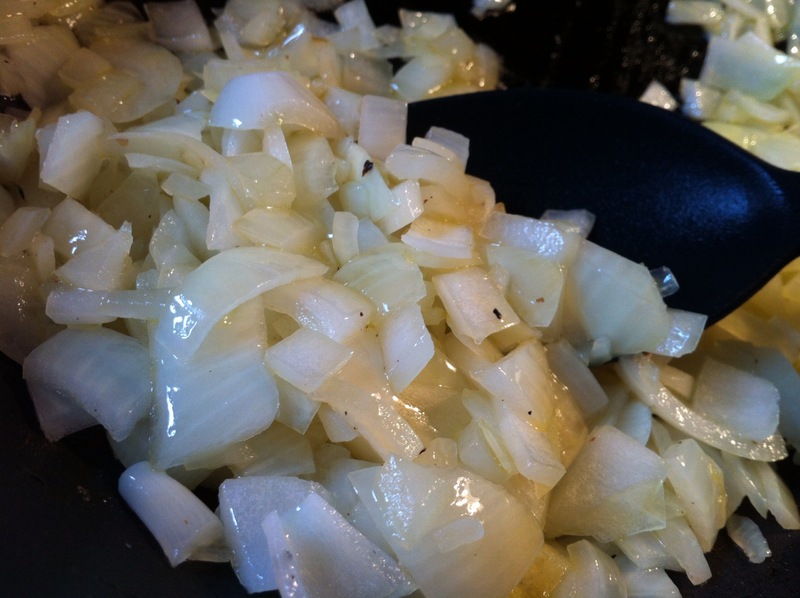 Chop the onion and saute in a skillet over medium heat until translucent. 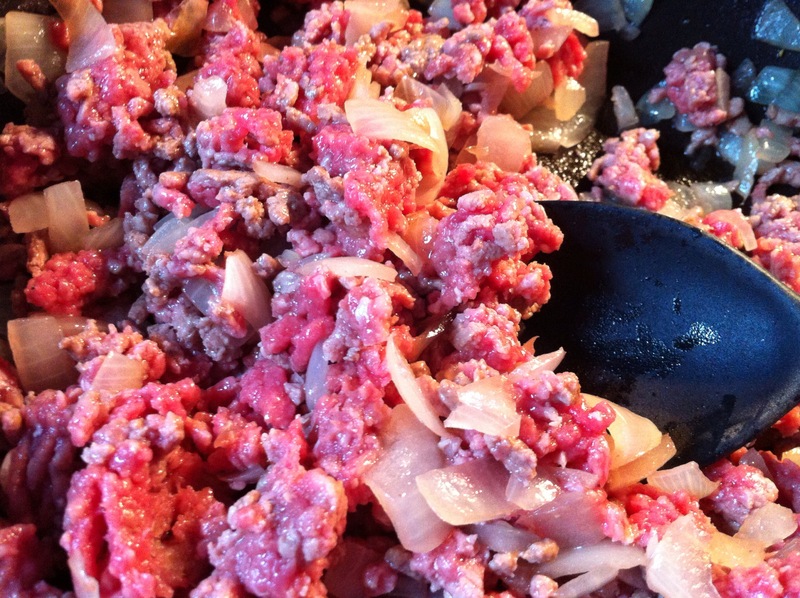 Season with salt and pepper and add the ground beef. Cook, stirring, until just browned. 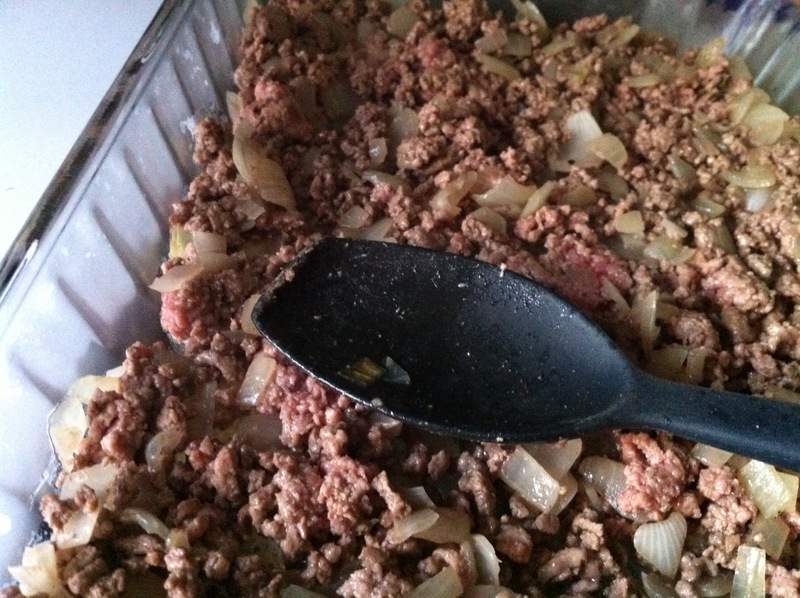 Pour the onion-beef mixture into a large glass baking dish. 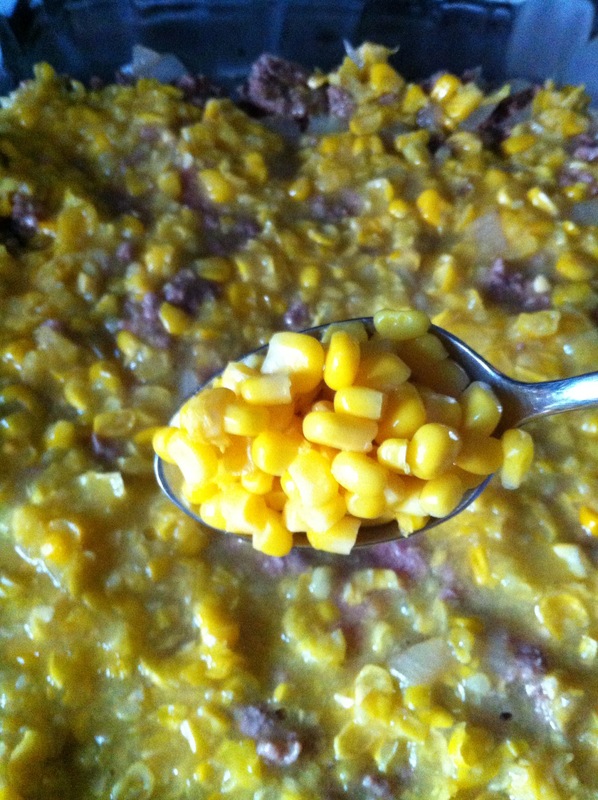 Pour in one can of creamed corn and spread into a thin layer on top of the beef. 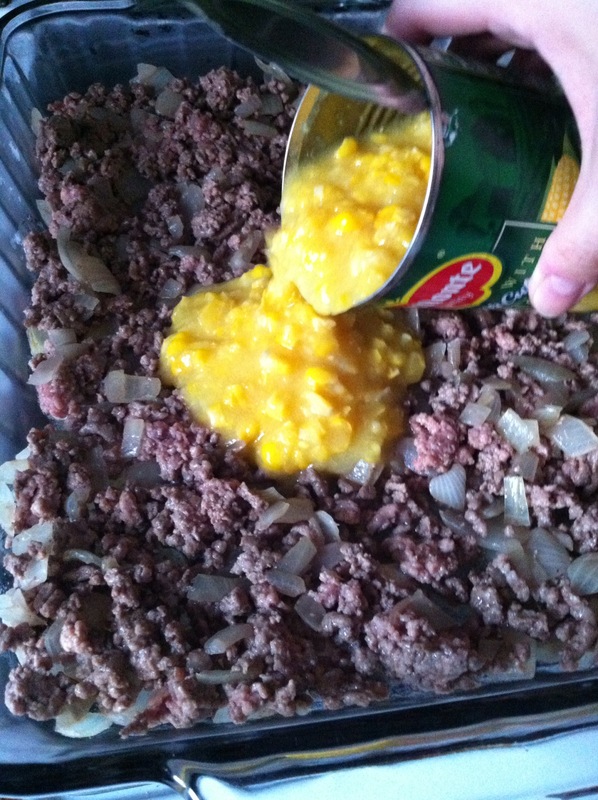 Add the can of sweet corn and distribute evenly over the creamed corn layer. 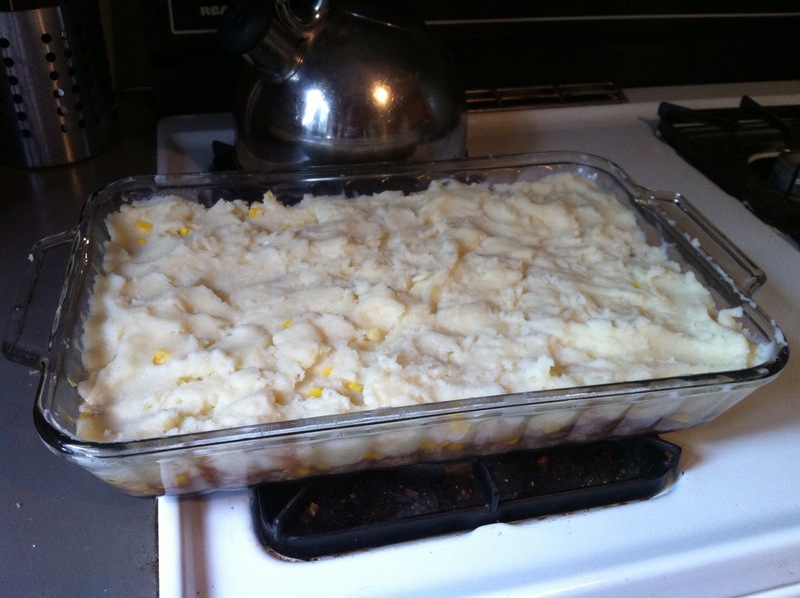 Preheat the oven to 350 and prepare your instant mashed potatoes if not done already. 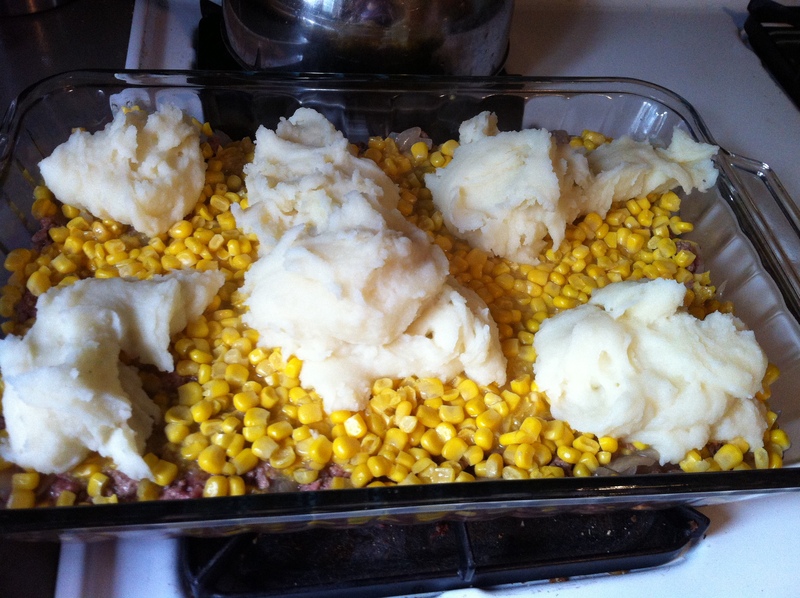 Top the corn with the potatoes, spreading out in an even layer. Cover with foil and place in the oven. Cook for half an hour, remove foil and cook 10 minutes uncovered or until the top is browned and bubbling. Enjoy! Tip: If you are going to reheat this, I would suggest adding a dollop of butter to the top before you put the cooked pie in the fridge. That way, when you pop it in the microwave, the butter will melt and re-energize the potatoes a bit. I highly suggest setting some aside for leftovers if you can — it’s honestly even better the second day. 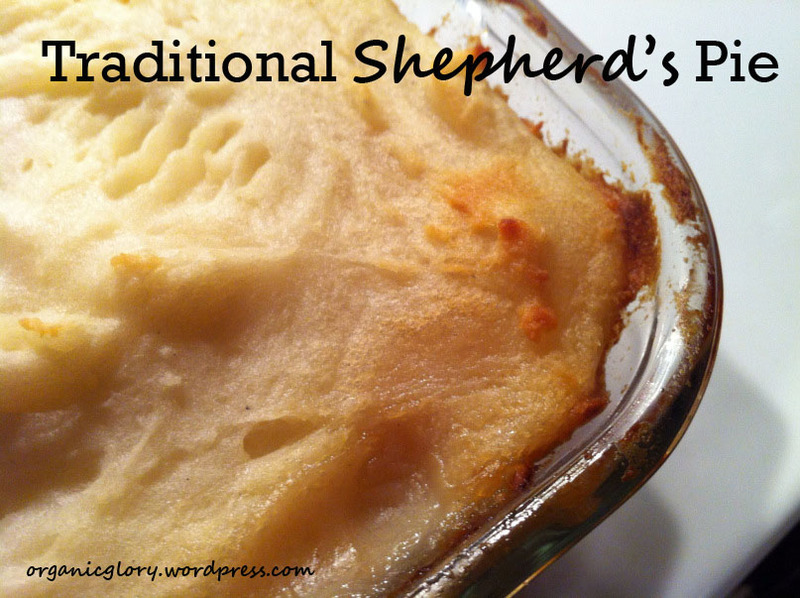 This is the Shepherd’s Pie recipe I was looking for – I wanted something simple. Personally, I prefer real food over fake foods (processed or GMO), so would definitely use organic corn as 90% of corn in the US is fake aka genetically modified. And canned foods have harmful BPA (a chemical hormone disruptor) in the lining, so I never use canned foods anymore. 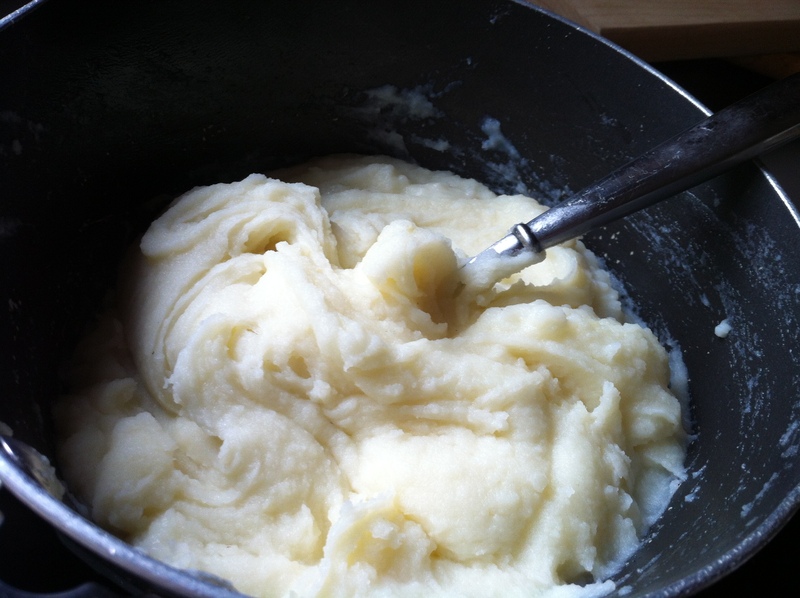 It’s worth the extra time to prepare real foods (mashed potatoes) because of the intelligence and benefits (nutrients) that are built in. Man-made (processed/GMO), not so much. Thanks for posting this… now, I’m headed in the right direction. Teri, such great points! Thank you for your perspective. I totally agree regarding GMOs, and am even more attuned to this now that I am responsible for raising a child. It has opened my eyes to all the nasty things out there. I love it! i love the short cut wit the potatoes lot smoother and alot easier ! ty Organic Glory! Cheese–interesting! No one in my family makes it that way but now I’ll have to try it! 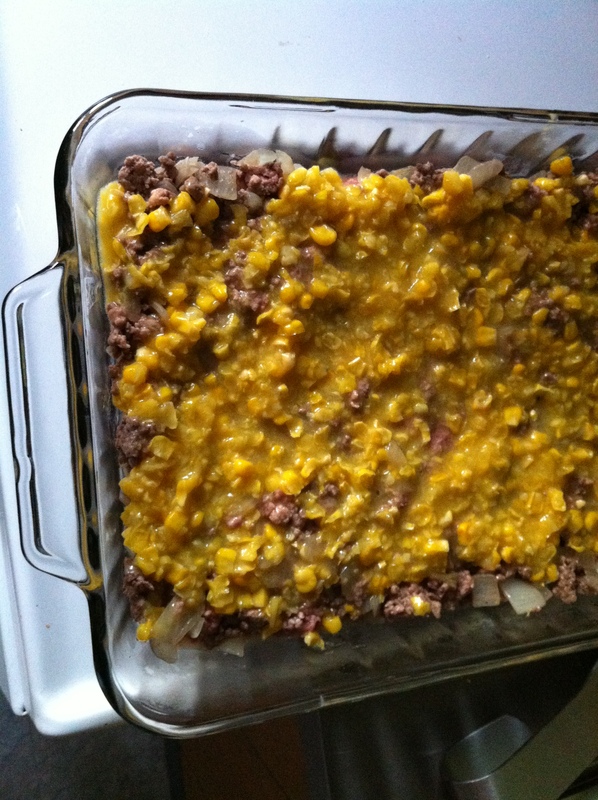 Never hurts to add a small amount of brown or beef gravy over the ground beef before adding the cream corn. What a great idea Susan! Reminds me of my grandmother’s recipe. However, what size is the large pan you are referring to and the size of the box for the mashed potatoes? I have seen several different boxes and the large pan can refer to many large sizes. I use a 10×15 or 9×13 pan depending on how deep I feel like making the pie. In terms of potatoes, I always make extra — sometimes the whole box — because it is much worse to be short than to have overflow! Do you drain the can of corn? I am making this tonight so I hope you answer!! I am so excited to make this!